THE PANAMA CANAL REVIEW May 4, 1954 THE SPEAKERS STAND wa; erected between the memorial and the base of the Building steps. Left to right are: Richard H. Whitehead, of the Goethals Memorial Commission; Dr. Thomas R. Goethals; Senator Alexander Wiley; Lt. Gen. Horace L. McBride, saluting; President Remon; Governor Seybold; George H. Roderick, Assistant Secretary of the Army; the Rt. Rev. R. H. Gooden; Maurice H. Thatcher; the Rev. Alexander H. Shaw, and the Rev. J. F. Konen, C. M. upon a leader of General Goethal's stature to supervise our construction forces and to set the pattern for the Canal's successful operation. It is most fitting that we should perpetuate his memory by a memorial at the scene of his extraordinarily distinguished services. My congratulations go to all those who served with General Goethals and to those who now serve in the operation of an engineering masterpiece which by itself stands as a memorial to the genius and industry of many dedicated Americans. Sincerely, DWIGHT D. EISENHOWER After the speakers had finished, the Colonel's son pulled a cord, and tricolored bunting which had shielded the monument, fell away. The monument said "Goethals," but every oldtimer in the audience knew that meant "The Colonel." The formal dedication of the memorial at the head of the Prado on March 31 was the highlight of the three-day program but other activities had kept the oldtimers and their families busy. DR. THOMAS R. GOETHALS took the microphone on the ferry Presidente Porras to greet some 200 of his father's co-workers during the trip from Gamboa to Balboa. TRIM IN bright red trousers and white shirts, the Balboa High School Band waited at Pier 18 to greet oldtimers when the Presidente Porras docked. MARY PICKFORD swapped stories at the Tivoli Guest House with some of the oldtimers. 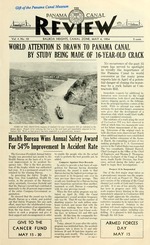 May 4, 1954 THE PANAMA CANAL REVIEW Altogether, about SO oldtimers had come from the States to attend the dedication ceremonies. Those arriving by ship had been briefed before they landed and were personally welcomed by Governor Seybold on the pier. Badges and details of the program were given to them and to others at a specially arranged Oldtimers Information Center at the Adminintration Building. On March 30, over 200 of the oldtimers boarded the ferryboat Presidente Porras at Gamboa to make at least part of the transit of the Canal which some of them had never seen filled with water. Sons of oldtimers manned the towing locomotives which pulled the Porras through the locks. The Balboa High School Band played "Hail, Hail, The Gang's All Here" as the ferry berthed at Pier 18. That night the oldtimers built the Canal all over again at a reception at the Tivoli Guest House, watched squaredancers, listened to songs of the old days and to a special "Panama Canal Waltz," composed in their honor by Charles Bath, of Margarita, who had helped sanitate the Canal Zone. The next day they watched an exhibition Little League baseball game played by grandsons and great-grandsons of Canal builders and attended a special movie premiere at the Balboa Theater. Some of the oldtimers had an added thrill when Mary Pickford, once America's Sweetheart, visited them at the Tivoli. The last event on the formal program was a picnic on April 1 at Morgans' Gardens at Miraflores, given for the visitors by local retired employees. When it was all over, the oldtimers were tired, but not too tired. They still had enough energy to wear down a good many people half their age. One Zonian watched his apparently tireless parent and said: "I know now how they managed to build the Canal. The Governor ought to fire the whole bunch of us and hire them back again!" GRAVES OF the oldtimers were nut neglected. On the Pacific side, J. H. de Grummond, left, representing the Sons and Daughters of the Oldtimers, and Rabbi Nathan Witkin held a brief, non-denominational service. Boy Scouts provided an honor guard. GRANDSONS AND GREAT-GRANDSONS of oldtimers played a Little League exhibition game for the const 'uction-day workers. A big sign said: "Welcome Grand Mom and Grand Pop." CLOSING EVENT of the three-day celebration was a picnic given at Morgans' Gardens at Miraflores by the local retired oldtimers for the visitors from off the Isthmus. There was plenty of everything and the oldtimers proved that they had lost none of their prowess as stout trenchermen.